Hip-hop has always been an inspiring genre in music and video games. Though some may not like it because of the curses and the sometimes 'inappropriate' words for the public - behind all those are inspiring stories. Adults see children singing songs with curses, but in the perspective of children, they relate to the meaning of the song. Snoop Dogg is one of the most influential people in the world of hip-hop and rap. 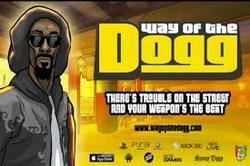 However, without any warning whatsoever, he released a video game called Way of the Dogg. Way of the Dogg, simply put, has garnered a reputation for being one of the worst video game today. Let me give you first some details so you could be the judge yourself. The first thing about this game is that it's a rhythm game. It's somewhat on the lane of 'Elite Beat Agents', however, the difference in quality is outstanding so don't get too excited. The story of the game revolves around a man named 'America Jones'. (Here's the cliché part) America Jones is a mofo and he's aiming to initiate a revenge against those who've killed his lover and partner, Sierra. In order to have the power to take revenge, he seeks the guidance of Snoop Lion and learn Kung-fu. This is no Barbie Dreamhouse Party, the main game involves battling the evil enemies of Jones. However, this is only a rhythm game - buttons will make its way to the screen and you have to time them with the beat. There are a lot of varieties to pump up the game like 'more than one' buttons that you'd have to press the same time or buttons you need to hold for a prolonged time. Aside from this and the amped difficulty, there's not much going on with the game. The game definitely packs a punch on its rhythm. Unfortunately, with more preparation, it could've been something more, but for now, there are still more games out there that would be more worthy of your time.